As everyone know, PC files can be accidently deleted, corrupted, or hard drive failure, etc. Another problem may facing could be amount of space for hard drive occupy. This all are the reason creating a complete system backup is important to ensure all of the important data is backed up. 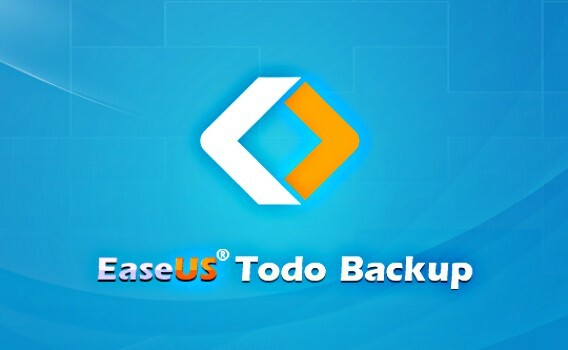 EaseUS Todo Backup Home is a solution for everyone which is specially designed for Windows operating system that features file backup, file recovery, file backup management, and disk clone. EaseUS Todo Backup Home also provides protection to data and support back up the entire PC operating system, applications, and data. The new updated version solve the users problem which feature backup scheduling and location storage to ensure data is backup and protect with top perform security. In addition, the program also comes with user friendly interface with display core features on the Home tab such as system and file backup options, disk cloning, and backup management. System backup – Full system protection allows you to easily back up and recover your entire operating system when disaster happens. Disk imaging – Block-level disk imaging quickly and efficiently backs up the entire disk or volumes. It can speed up the backup process of large files as it only backs up the modified blocks of data instead of the entire file. File backup – File-level backup allows you to selectively back up specific files, folders or file types, including network shared files. Hot backup – Integrate with Microsoft Volume Shadow (VSS) to back up files that are in use, back up specific files and volumes without interrupting any current operations, especially for open files backup. Outlook Email backup – Back up all emails in Outlook Express or 2003/2007/2010/2013/2016 and save them in a safe way. Sector-by-sector backup – Store an exact copy of your disk or volume, including unused space, sector-by-sector backup assures you a 100% identical copy to the original. Full backup – Only a full backup allows you to restore the exact configuration of your PC, including your operating system, applications and all your files. Incremental backup – Only back up changes made since the last backup, significantly reducing backup time and storage space. Differential backup – Only back up changes made since the last full backup, saving time and storage space. Schedule backup – Flexible backup scheduler allows backups to run based on daily/weekly/monthly, or to be triggered by specific events (users logging in or out, system startup or shutdown). System restore – Quickly recover your entire Windows system backup in minutes to the original or new location using a Linux or WinPE bootable media. Flexible disk restore – Quickly restore what you need, recover granular files, folders, volumes, or all from a single disk image. Selective file restore – Recover individual files and folders from a file backup image without restoring an entire image. Outlook Email restore – Disaster recovery for Outlook Express or Outlook 2003/2007/2010/2013/2016. System migration – Fast, easy and safely migrate system to a SSD without reinstalling Windows. Pre-OS recovery environment – If your system won’t boot, simply select EaseUS Todo Backup from boot menu to launch Pre-OS and then recover your system. Backup management – Easily manage (view, edit, update, delete) backup job and automatically delete the out-of-date backup images, saving storage space. Email notification – Notify administrator with the results of backup operations via multiple email addresses. Backup compression – You can back up files/volumes without compression or you can select high compression level to keep backup as small as possible. Splitting backups – Split backup image files into different sizes to fit different storage devices. Pre/post commands – Define commands (scripts) to execute the commands after or before backup tasks. 256 bit AES encryption – To avoid unauthorized access to your backup image, you can easily encrypt backup with 256-AES encryption algorithm. Offsite copy – Store backup images on FTP server as well as on any local storage device. Log reporting – Record and view backup task names and operations for the PCs. Migration and clone – Fast, easily and safely migrate system to an SSD or a bigger HDD for disk replacement or upgrade. Explore backup – Just double click backup image to browse backup with Windows Explorer and simply copy-paste files/folders or directly recover. Check image – Check integrity of image file and make sure the backups can be restored successfully. Create emergency disk – Create a Linux-based or WinPE-based bootable media in case of emergency, especially for system restore. No reboot required – Install EaseUS Todo Backup and begin backup immediately. No need to reboot to complete the installation. Multiple backup destinations – Store backups to multiple destinations: CD/DVD, local hard drive, external drive, iSCSI device, NAS, DAS or network destination. Support NAS & DAS – Work well to popular NAS products or locally attached storage. Compatible with GPT/UEFI – Create a WinPE-based bootable media for your 64-bit Windows system resided on GPT to successfully start up PC recovery from it in case of emergency. Support for latest HDD standard – Enjoy support for advanced format drive, 16TB or more and non-512 byte sector size drive. Support for USB 3.0 – Manage external hard drive more effectively by using all benefits of USB 3.0 interface. Multiple Languages Supported -English, Deutsch, Español, Français, Italiano, Português, Polski, 日本語, 中文 (繁體), 中文 (简体). Visit the official EaseUS promotion page from HERE. Click the “NOW FREE” button and wait for license code to appear. Download EaseUS Todo Backup Home 9.2 installer: TBHome_Trial_9.2.exe (114MB). Install and activate to full version by fill in the license code. 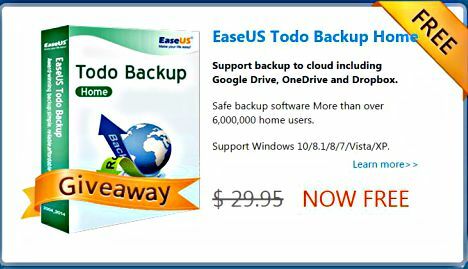 EaseUS Todo Backup Home 9.2 compatible with Windows 10, Windows 8, Windows 7, Vista, and Windows XP.